Custom designed and quality built by the owners of a construction company, this truly one-of-a-kind eight-acre estate has been thoughtfully and expertly designed in the best traditions of welcoming hospitality. In addition to the two-story farmhouse with its huge and inviting front and back covered porches, there are a charming guest cottage, three barns, a chapel (or studio/office), a sparkling in-ground fiberglass pool, and a pool house. The almost-8000 square foot home has been expertly decorated and is not just move-in ready, it’s live-in ready because many of the furnishings and décor can be purchased separately. Notable features include a huge great room, a “wow!” factor gourmet kitchen ideal for entertaining, dual staircases, a kid-friendly mudroom, and stained glass in the master bathroom and several other locations–and these are only a few of the highlights! You won’t find a comparable house on the market like this must-see beauty. Not just another McMansion that will be dated in 10 years, this home is a timeless, traditional family home situated on a beautiful estate conveniently located in town. Sit on the back porch and watch the sun set as your horses drink from the tank dated 1937, as the water lilies close for the evening. Take your dogs out for a splash in the property’s winding creek and gurgling rivulets, and you’ll feel just a bit more human. Life is a more precious and peace more accessible when your home is a haven like this one. Zoned agricultural, but surrounded by upscale residential areas and close to all the amenities, this is a place where you can have it all. If you want to raise your children and grandchildren with fresh eggs and apples picked from your own orchard, if you fancy having a good garden and raising your own grain-fed beef; if you want an estate that can accommodate weddings, celebrations, and gatherings of all varieties, and an acreage fit for gentleman and gentlewoman farmers, look no further: This is it. Brew yourself a cup of tea or pour a glass of wine, and take your time browsing. Welcome to your Home of Love & Dreams. Approach on the north side of the circle drive. 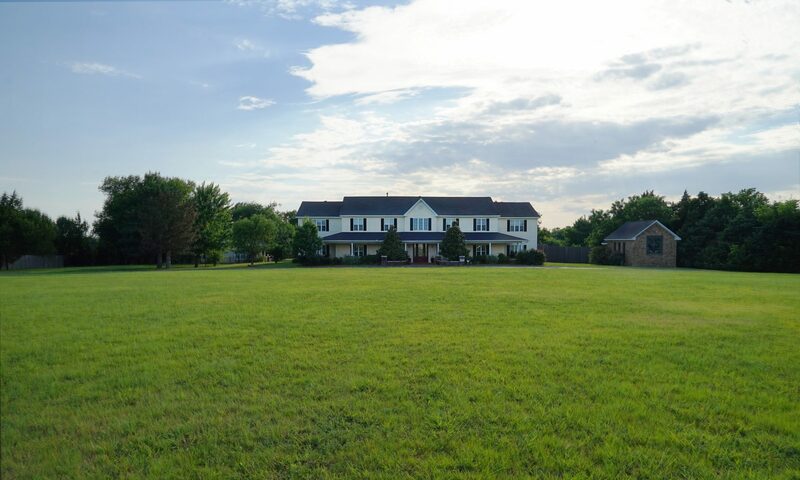 This Land Run property was among the first developed on hundreds of acres of beautiful farm land and fields. Surrounding the house was nothing but forests, fields, and wildlife. A 1920s era farm house was situated exactly where the current farm house stands. At the time of our purchase, a pioneer-era dugout and a lean-to that appeared to have been built later were still visible just south of the main barn, where the ground dips down toward the creek. The pioneer owners obviously wanted access to clean running water. As one generation after another acquired and improved the property, each made improvements that made life there sustainable. The lily-filled watering trough is dated 1927. The large barns were build around the 1940s to 1950s and the barn now housing the large workshop was a dairy barn when we bought the property. You can still see where doors leading into grain bins used to be if you look at the original barn siding on the north end of the shop. Also on the property at the time of our purchase were a number of outbuildings such as a chicken house, tool shed, tractor shed, and cyclone cellar full of cobweb-covered canned fruits, vegetables, and jellies. We left these alone, other than leveling them for reasons of safety. Underground, somewhere between today’s pool and the ‘dog yard’ east of the guest cottage are the cellar and artifacts from these structures. We kept the gate leading into the chicken yard, and it hangs on the east side of the pool house now. Throughout the property, one finds old farm implements that survived previous owners and have found their way onto the walls of the barn, or lean up against the house in the west herb garden. Trees on a property line to the northwest have grown around and into an old plow. Horseshoes hanging here and there in the farm house, guest cottage, and barn were all found on the property. We honored those artifacts as caretakers of a homestead we knew would outlive us. We hope new owners will do likewise. Please see the contents menu below for details on each area of the farmhouse. Sisters sitting in the winter field. This is a good view of the yards, fields, and woods, thought it doesn’t show the entire property.